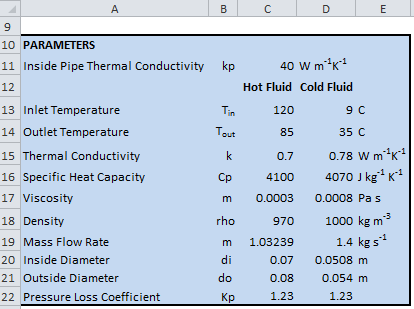 This Excel spreadsheet helps you design a double pipe heat exchanger (also known as a concentric tube heat exchanger). Double pipe heat exchangers are often used in the chemical, food processing and oil & gas industries. They have a particular advantage when close temperature approaches are needed or in high pressure applications. 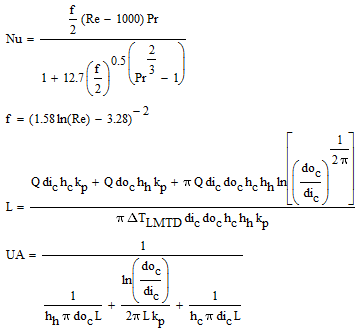 Gnielinski correlation for the heat transfer coefficient of the shell side and tube side fluids (hh and hc). The Gnielinski correlation is valid for 0.5 ≤ Pr ≤ 2000 and 2300 ≤ Re ≤ 56.It gives the heat transfer coefficient in terms of the friction factor, the Reynolds number and the Prandtl number. Filonenko correlation for the friction factor (valid for smooth pipes in turbulent flow with 104 ≤ Re ≤ 107). Step 1. Enter your parameters. 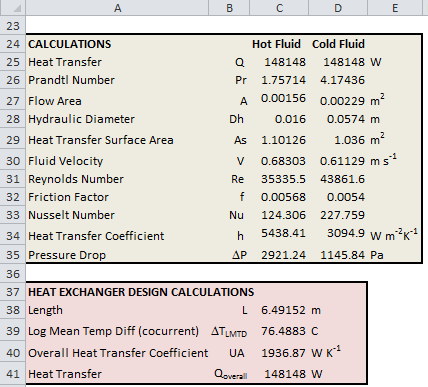 The spreadsheet will calculate initial values of the heat transfer coefficients, the rate of heat transfer across both fluids, and the length of the heat exchanger. Provide an initial guess for the parameter (i.e. mass flowrate) you will change in Step 2. You have now established important design parameters, such as the fluid velocities, the tube-side and shell-side pressure drops, Prandtl numbers, the length of the heat exchanger and so on. This spreadsheet is completely free. If you have any comments, then please let me know. Download it from the link below, and please bookmark or share this website wherever you feel it appropriate. I am working on a process, where it is vitally important to accurtely size the double pipe heat exchangers. Too big and we create serious process control problems and too small and we limit plant capacity. Your spreadsheet is very good and well thought out. I did find a couple of minor discrepancies, which were very easily corrected. The hydaulic diameter of the inner tube should be equal to the ID of the inner pipe and the flow area of the inner pipe shouild be based on the ID not the OD. I have not previously come across your formulae for UA and total tube length before and I wonder where you sourced them. We calculated UA from Q/DTlm, and it was exactly the same as your UA. How to define the pressure loss coefficient in the input parameter box. Hi Samir, I would like to know which is the reference source for your Nusselt Number calculation? Should not you use a different correlation when Re < 2000 (laminar flow)and 2000 < Re < 10000 (transient flow)? By using your formula, we will get several negative numbers when Re is < 1000. Does the calculation work if I change tube and sell side?